June, an early month of the summer break, offers time to explore activities, areas and interests on campus that you may not have time to during the busier parts of the year. 1. 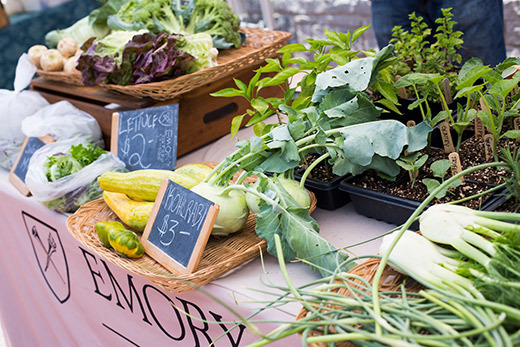 Take advantage of more Emory Farmers Markets. Testing out a new schedule, the Emory Farmers Market will be held every other week instead of monthly as it usually is during summer breaks, until the regular weekly event returns during the academic year. The next market on June 19 has a special theme: Peach Festival, featuring those special, golden fruits of summer whose taste can never quite be duplicated from the grocery store. Also, look for a special performance from participants in the International Euphonium Tuba Festival. The market is free to attend and you can spend as much or as little as you’d like on fresh local food with organic options available. 2. Join indoor or outdoor walking groups. Two walking opportunities start Wednesday, June 13. If you’re a morning person and/or prefer walking outside in the cooler time of day, join the group at 7:30 a.m. on the Quad. Meet at the Quad side of the Candler Library to check in. Prefer to walk later in the day or inside? Meet at the Emory University Hospital tunnel at noon on Wednesdays. You can beat the heat by getting in some movement in a climate-controlled location. The tunnel connects Emory University Hospital, Emory Clinics A, B and C, and the Emory Rehabilitation Hospital, so the walk offers a chance to experience parts of campus you might not usually see. Both walking opportunities meet Wednesdays for six weeks, from June 13 to July 25. They are free. 3. Catch two exhibits ending this month. “Stepping Out of Line: Exploring LGBTQ Activism” is on display through June 13 at the Rose Library, on Level 10 of the Woodruff Library. From the LGBT collections and university archives in the Rose Library, the exhibit looks at activism as it related to AIDS, discrimination, marginalization and the changing norms and awareness at Emory. See it during Rose Library hours: 9 a.m. to 5 p.m. Monday through Friday. Downstairs, on Level 3 in the Schatten Gallery, “The Dream Machine: The Beat Generation & the Counterculture, 1940–1975” will be on display until June 17. The exhibition focuses on the fascinating countercultural writers known as the “Beats” and is the first major consideration of these writers in the United States in nearly a decade. You can see rare artifacts, including posters, first editions, beautiful art books, letters, photographs and more from the Rose Library’s rich literary archives. Check the library hours for times. 4. Listen to music or an audiobook. The library recognizes that many users don’t have a way of playing CDs — for example, laptops and cars don’t often come with CD players anymore. Because of this, the Music and Media Library is now checking out USB CD/DVD drives. It’s all free. 5. Get that writing project done. Need a productivity boost on a writing project? Whether it’s professional, personal or just a project, join Emory’s Center for Faculty Development and Excellence for Sit Down and Write. Come to Kaldi’s Coffee in the School of Medicine (unless otherwise posted on Facebook) on Tuesdays or Peet's Coffee and Tea in the Woodruff Library on Fridays at 11 a.m. with your computer, legal pad, notebook or whatever you’re writing on. You can also connect via Facebook and be a virtual member of the group. Everyone is welcome. Write for 25 minutes, take a five-minute break, write for 25 more minutes, then take a few minutes at the end to catch up. Accomplishment is guaranteed and free. 6. Enjoy two free tuba concerts. The 15th Annual International Euphonium Tuba Festival takes place June 16-24 at Emory. International guest artists and musicians from here and abroad will be on campus for master classes and more. Participants will perform at an outdoor concert on Tuesday, June 19, at the Emory Farmers Market. The week concludes with a gala concert on Saturday, June 23, at 7:30 p.m. in the Schwartz Center for Performing Arts. Both concerts are free. 7. Dive into the pool and a movie at the SAAC. The Student Academic & Activity Center at the Clairmont Campus pool is going full swing now and offers a variety of cool experiences for the summer. There are lessons and laps in the Olympic-sized and teaching pools and there’s a kiddie pool and diving well. On Friday, June 22, there’ll be a Dive-In Movie along with live music, inner tubes, games, popcorn, glow necklaces, a dance contest and more. Gates open at 7 p.m. and the movie starts at dusk. Cost is $2 per members with $5 per guest. 8. Explore the meaning of prayer. This summer, 10 Candler faculty and staff members will headline a lecture series at Glenn Memorial United Methodist Church entitled “Prayer in Word, Tradition, and Practice.” The sessions, free and open to the public, will take place on Sundays from 9:45 a.m. to 10:30 a.m. in Glenn’s Ward Fellowship Hall. They explore prayer in all its formats and traditions, including prayer as song and as spiritual writing. The series begins Sunday, June 10. 9. Participate in a WaterHub tour. Tours of Emory’s WaterHub, the first system of its kind to be installed in the United States, have now been set for the month of June. If you haven’t already, sign up to see this on-site water recycling system, which utilizes eco-engineering processes to clean waste water for non-potable uses. Trained student guides tell you all about the amazing processes and outcomes of this facility and the system’s plants will be at the peak of their lushness. The student-run Emory Buddhist Club continues during the summer. Every Thursday, the group hosts a senior teacher from one of Atlanta's diverse Buddhist centers who provides instruction, guides practices such as meditation, leads discussion and answers questions. Tea and snacks are served. Everyone is welcome and the sessions, held in Room 106 of Cannon Chapel, are free.